I'm already looking ahead to albums from the likes of Maggie Rogers, Indoor Pets and Busted next year, but first, it's time to reflect on some of the wonderful music that I've been enjoying this year with a round-up of my favourite albums to be released in 2018. It's taken a lot of thinking (you hardly need me to tell you it's been a brilliant year for new music!) but I've whittled it down to a top five, which I'll follow up with some more albums I've really been loving this year. If you've seen my posts during the year, it's probably not all that surprising that Rae has secured the top spot and deservedly so. I've pretty much spent the entire year telling anyone who will listen that I completely adore this record, and seeing Rae perform twice towards the end of the year cemented my love for these tracks. At the time of release, lyrics on many of the tracks were incredibly relatable, meaning that I connected with the album in a way I'd never really experienced before. This is a very special album for me. Picking a favourite track is almost impossible as I genuinely love every second, but if I had to choose, it'd be Dip My Toe. Until this year (to my shame) I hadn't even heard of Novo Amor before, but instantly fell for his beautiful falsetto vocals when I saw the Birthplace video over Summer. The video is a cinematic masterpiece in its own right, highlighting the issue of plastic pollution in our oceans. Finding that he had a page on his website detailing ways in which his album campaign and upcoming tour were going to be sustainable, I knew I'd stumbled across an artist I'd likely fall in love with, and I was right. The album may only be 33 minutes long, but those are 33 of the most stunning minutes of music I've heard this year and I absolutely can not wait to catch him headlining my favourite festival Bushstock next year! Favourite track: Repeat Until Death. Probably my most highly anticipated album of the year, my favourite chaps Mumford & Sons did not disappoint with Delta, their fourth studio album, though they did make us wait until November, and snuck into the top five at the last minute! The album has had a mixed reception from critics and fans alike, but I find that part of the joy of music is that it's totally subjective, and I personally love the record. The band themselves have expressed the belief that it's their best record yet, and I'm inclined to agree with them (but don't tell Sigh No More that... it'll always be a classic album for me!) Favourite track: Wild Heart. I'd challenge anyone who has listened to the Idles album this year to claim that it isn't one of their albums of the year. And to anyone that hasn't: listen to it, pronto, and add it to your list. I'm guilty of at first labelling the band and album as angry rock music, but delving deeper (and reading interviews such as this one with the BBC) has shown me that there is a lot more to this Bristol band than I initially realised. It's an incredibly socially conscious record, exploring issues such as Brexit and toxic masculinity, as well as real losses that singer Joe has endured in recent years. The album takes these negative subjects and turns them on their head, providing songs that celebrate difference and are full of hope and unity. Idles are the band I didn't know I needed in 2018. Favourite track: Danny Nedelko. So that's my top five albums this year! There have been so many more that I have absolutely loved in 2018, so here's a list of some more (in release order) that I wholeheartedly recommend you checking out. I'm always slightly overwhelmed when an artist asks me to premiere something for them - it's an honour that any musician should want my little blog to be the first place that their fans can listen to their new music or see their new video. It's a small but growing list, so thanks to Little Brother Eli, Maiians, Hazey Jane, The Cooling Pearls and Pêtr Aleksänder for endowing me so much trust over the last couple of years - here's to more features of this kind in 2019! For now, I'm rounding off 2019 with one last premiere, as Oxford's The Cooling Pearls are back for more with the video for their new (but actually, quite old) tune Welsh Funeral, filmed and edited by friend of the band, film-maker Gem de Silva. "The song is an old one that I wrote in 2007 after my Tadcu (Welsh for Grandad!) passed away. He was one of my best friends and I guess the first person close to me to die. I was brought up in South Wales surrounded by a loving, close family and since then the song has grown to reflect upon the passing of my mum and uncle. The lyrics are just how I feel about the whole situation I suppose - we are born, we all feel different emotions in between, we can see and believe what we want about it all and then we die. Everyone grieves in different ways and I guess this song is part of the process. Playing it live every so often is part of that too and then in a way it never goes away but keeps the people involved close to me and in my thoughts. I suppose that's what I've tried to further with the video as well. Some of the lyrics - 'your clothes are on my back and your words are on my soul' - literally reflect that I have always worn some of my Tadcu's clothes (the jumper in the video for instance) and keep hold of loved one's belongings as a memento and it keeps them close to me. [Gem & I] both had ideas and locations in mind and tried to make something to reflect the emotions of the song without being too cheesy. We filmed the video in South Wales, initially on the beaches in Porthcawl and Port Talbot. To reflect the warped and sparse nature of the song Gem wanted it to be very bleached out in parts and so we were lucky with the weather that day. We filmed the piano parts in my mum's old front room on her piano with that portrait of her - she was a songwriter and my brother and I recorded her last ever recording right there in May 2015, so it's all linked in some way. We then went up into the hills around Ammanford where we spent a lot of time together as a family and where my mum and uncle's ashes were released - it's very bleak and beautiful up there and I always thought it would work well with imagery for Welsh Funeral. It's all a homage to the people I love and miss - this song just keeps me thinking about them and thus they're still close in some way. The rest of the album, although pretty melancholy, has multiple harmonies, layers of guitar, drums (our first album had no drums! ), bass and many other extra musical finds which you can get lost in. People usually release tracks that capture the album, but with this I think this song has been with me so long and is very personal, it'd be nice to give it to others to delve in to." Watch the video for Welsh Funeral below, listen to a brand new remix of the track by Message To Bears here and be sure to grab your copy of The Red Laugh on Bandcamp here. Follow The Cooling Pearls - Facebook | Twitter. How to improve one of my favourite tracks from this year's Evergreen record Overseas, you ask? Let Franc Moody loose on it. The London group have remixed The Foreigner and it makes for one of the best tracks I've heard all year. Up there with the best remix I've heard this year, alongside the Everything Everything reworking of Rae Morris album title track Someone Out There. If you like what you're hearing below, I implore you to listen to both Overseas (listen out for other favourites Gemini and Bloom) and the Franc Moody EP Dance Moves which is the ultimate bop from start to finish. This genuinely is some of the best music related news I've heard in a long time. My favourite festival Bushstock have announced the first few acts for the 2019 festival, including my favourite musical discovery of the year Novo Amor, who is the first headliner. Can. Not. Wait. Bushstock is a one day multi-venue festival held in Shepherd's Bush and organised by the folks at Communion Music. Across my four years of attending I've caught the likes of Nick Mulvey, Matthew & The Atlas, Seramic, Amber Run, Ady Suleiman, The Staves, Tamino and Frances. They're my favourite label, working with some of my favourite artists, and it's always a wonderful day of music discovery - the worst part is deciding which artists to miss! Alongside Novo, they've also announced the equally brilliant MarthaGunn, as well as Apre, Olivia and Winnie Raeder with a lot more to be announced. Grab bargain early bird tickets for the festival, which takes place on June 15th 2019, here. Tickets for the tour are on sale here, with full dates as follows: Oporto, Leeds (4th Feb); Poetry Club, Glasgow (5th); Eagle Inn, Manchester (6th); Cuban Embassy, Birmingham (7th); Cavern, Exeter (9th); The Lexington, London (11th); The Prince Albert, Brighton (12th); Joiners, Southampton (13th); Sound House, Dublin (14th). Follow Ferris & Sylvester - Facebook | Twitter | Instagram. I am always up for a bit of dream-pop... I've really enjoyed discovering Honey Moon this year, and loved Willie J Healey's 666 Kill EP. The latest in gloriously smooth dream-pop comes in the form of Coffee Stained Smiles from London quintet Margot. It's the first in a series of three singles, each tackling the topic of mental health. This first track is inspired by a scene in the recent film Lady Bird, where the central character's mother only gets time to herself, time for contemplation, on her drive between work and home. As a retail worker (particularly over the festive period) this is pretty relatable - there's a constant pressure to be visible and welcoming to customers, who, particularly at this time of year, might not always show the same courtesy in return. The track's inspiration is translated to an imagined middle-aged man's rainy drive, focusing upon his partner's concern for his mental health, with the repeated lyric "oh it's all so hard to tell, if he's up or down I can't tell." While the situation is imagined, it's all too common, as vocalist Alex Hannaway explains - "I've had experience with adults of that age stoically withholding information in regards to their mental health and I've seen how this can affect friends and family. It's desperation, it's unconditional love, and a hope that things can turn around." Listen to the track below and keep an eye out for the upcoming singles. hope that things can turn around. Follow Margot - Facebook | Twitter | Instagram. Probably one of my most highly anticipated releases of 2019, I'm eagerly awaiting the debut Fil Bo Riva record Beautiful Sadness, which is due in Spring. Following up recent single Go Rilla, we've been treated to another taster of the album in the form of slow burning L'over. The quiet opening provides the perfect backdrop to highlight singer Filippo Bonamici's trademark vocals and shows us that the band are capable of scoring something beautiful with more than just punchy indie pop - though when they do that, they do it very well! Take Head Sonata (Love Control) as a perfect example. The new track, Fil explains, is a "song [that] is trying to celebrate this weird twist of feelings - it's pretty much an homage to the little ups and downs that come with every liaison, a song inspired by that incredible strange feeling that we call jealousy." Franc Moody are one of my favourite live discoveries of the year. They supported at, coincidentally, one of my favourite gigs of the year, when Friendly Fires returned to the live stage with a show at O2 Academy Brixton back in April. As Friendly Fires have been a huge favourite of mine for years I had very high expectations for the show, and really loved their support set and was particularly impressed with just how well they fit alongside Friendly Fires. Support act choosing done very well. I've since been enjoying their Dance Moves EP a lot, and they've just shared a live video for the track Dopamine, which features one of the funkiest bass lines I've heard all year. Check out the video below, and if you want to catch them live, they're headlining London's Heaven on 17th April, tickets here. Follow Franc Moody - Facebook | Twitter | Instagram. The ever talented chaps Low Island have announced what I am pretty sure is their biggest run of UK shows to date for March 2019! The shows come in support of a new single due early in the year, with the tour taking in the likes of Southampton, Liverpool, Brighton, Nottingham, Reading and lots more, as well as a Low Island & Friends show at the Hackney Show Rooms in London. Pre-sale for the shows starts today with tickets going on general sale on Friday, 30th November. To whet your appetites and show you just how brilliant a Low Island live show here, I'm sharing this video of the brilliant track Too Young once again. Adore this. Full dates: Boileroom, Guildford (12th March); Joiners, Southampton (13th); Cookie, Leicester (14th); Phase One, Liverpool (15th); Hyde Park Book Club, Leeds (16th); Sunflower Lounge, Birmingham (20th); Green Door Store, Brighton (21st); Hackney Show Rooms, London (22nd); Thekla, Bristol (26th); Soup Kitchen, Manchester (27th); Bodega, Nottingham (28th); South Street Art Centre, Reading (29th); Broadcast, Glasgow (3rd April); Think Tank?, Newcastle (4th). Tickets here! Incredibly excited about this one! I've been a big fan of Jack Savoretti since hearing his third studio album Before The Storm back in 2012, and have loved watching his career blossom. In recent years, he's released two brilliant records, Written In Scars and Sleep No More, given several brilliant TV performances, supported the likes of James and John Legend on tour and played his own incredible live shows, touring the UK and further afield with his wonderful live band. His passion for music is infectious, and makes being a fan of his genuinely rewarding. Exciting news - he's just announced that his sixth studio record Singing To Strangers is due for release on 22nd March. Talking about the title of the record, Jack explains "that's my job: I sing to strangers. That's what I've spent most of my life doing. Singing to friends and family and fans; they're already onside, so you can, to some extent sing anything. Strangers need convincing, touching, connection." Produced by Cam Blackwood (George Ezra, London Grammar) and recorded in Ennio Morricone's studio in Rome this Summer, the record features Jack's live band, who he is taking on tour in April across Europe before heading back to the UK for a few shows. The tour culminates in a HUGE show at SSE Wembley Arena, which I absolutely can not wait for. I couldn't be prouder of the trajectory he's taking. Earlier this year, Jack featured on a duet alongside none other than pop legend Kylie Minogue. Music's Too Sad Without You is the closing track of her latest record - a live version from Venice features on Jack's upcoming record, check that out below! Grab tour tickets and pre-order Singing To Strangers in various formats, as well as signed copies, through Jack's website here. It's Mumford & Sons album release day finally! I can't wait to take my first listen.... With that in mind, I'm sharing some more indie folk in the shape of Orange from the Toronto based duo Moscow Apartment. Since finding the track in my inbox a couple of weeks back, I instantly added it to my playlists and desperately wanted to share it here. Making music in the same vein of bands like First Aid Kit, the duo is made up of multi-instrumentalists Brighid Fry and Pascale Padilla, who are ridiculously talented at just 15 and 16 years old. They describe the track as being about the "weird twilight-zone feeling that happens sometimes at sunset - when things suddenly don't feel read, like everything around you is a movie." Relatable - tick. They won the Canadian Songwriting Competition in the under 18 category with a demo of the track. Keep an ear out as they're currently working on their second EP! Follow Moscow Apartment - Facebook | Twitter | Instagram. Gengahr have been a stand-out band for me this year. Released back in February, their second album Where Wildness Grows is one of my favourite albums of the year, and it has since been followed by a live album. Their headline set for So Young at The Great Escape was the pinnacle of one of my most memorable evenings of discovery through live music this year (and probably, ever) where I managed to catch Tamino, Sam Fender, Superorganism and Dizzy in various Brighton venues before staying out for what is almost certainly the latest (or should that be earliest?) live performance music I've watched. Nothing, not even a slightly sleep-inducing 1am stage time, was going to stop me catching the band. Not content with releasing two full length albums in a year, the band shared the single Atlas Please a couple of months ago. They've just shared a video for the track, with the slightly ominous description "We almost died making this video. Literally buried ourselves in poisonous earth for your entertainment." With that kind of introduction, it would be rude not to check it out, right? My beautiful friends Catgod have shared their latest single Sleep In, just the right level of wonderful to leave me feeling a little homesick for their hometown, and my second home, Oxford, where we've had many an evening spent enjoying live music or eating brownies (never simultaneously, though that does sound pretty glorious.) Hearing the track for the first time while re-reading The Hobbit, it struck me that with its flute parts and soothing acoustic guitar, the track would fit perfectly in a Tolkien film adaptation - never a bad thing. As ever, Cat and Robin's vocals compliment one another perfectly in the song, but the closing flute solo really does steal the show for me. Sublime work! They've filmed their first ever music video for the track, directed and edited by talented Oxford-based photographer Milly Cope, who has worked on several photoshoots with the band in the past. Check out some of her work here! It's a lo-fi, hazy video which perfectly matches the track and (as is always a sign of a brilliant music video) even features a cute dog. 10/10 from me! It has been sitting on my list of tracks to write about for a couple of months, which usually means a track will disappear into the blogging abyss, but I knew I couldn't let this one slide - better late than never! London's Strong Asian Mothers returned with their latest single All I Do back in September. On first listen, the sound is a little darker than normal, contrasting with the almost amusing innocence of the refrain "All I do is drink... tap water from the kitchen sink." Their only new music of 2018, for me it's on another level to their previous releases, showing a band who are taking their time to create something truly worth sharing with their fans. Since the release the track has been added to the BBC Radio 6 Music playlist, making its way from the C-list to their A-list in a couple of weeks, and deservedly so. Get listening! Follow Strong Asian Mothers - Facebook | Twitter | Instagram. Looking for some live acoustic kitchen session goodness on your Thursday morning? A very specific request, but you're in luck... Banfi have shared this session of their latest single If Not For You and it's all kinds of lovely. Complete with a melodica, tight harmonies and even a cat, its worth a watch! They're out on tour in Europe at the moment, with a run of UK shows coming up this month, including London's Moth Club on 18th November. Check out the full dates and grab tickets on their website here! Need warming up? Bathe in the golden hues and seaside vibes of this new video from Margate's Thandii. The release is both visually and sonically stunning, showcasing her psychedelic sound with some strong 70s vibes. Having recently signed to 30th Century Records, the track is Thandii's first output through the label, and a track which she describes as being "written for cruising or travelling, without a place to be." The repetitive, almost hypnotic melody of the track (and by extension, the video) certainly gives off this vibe - we're not particularly getting anywhere, but this isn't necessarily a bad thing. Thandii describes the track as being about "infatuation or addiction, particularly between people [...] that moment when a person has succumb to the influence of another, and it has a powerful effect on them, but they're completely unaware of it." With this in mind director Tom Dream, Thandii describes, reflected this moment "with a wandering, slightly disorientated, dazed & confused cruise through different situations in day-to-day life." It's been a long time coming... Indoor Pets have finally announced their debut album Be Content, which is due for release on 8th March via Wichita Recordings. It has been co-produced by the band's guitarist James Simpson and Kristofer Harris (of Story Books), and mixed by Claudius Mittendorfer. The record features recent single Hi alongside brand new tune Being Strange, which is quickly becoming one of my favourite tunes from the band. With frontman Jamie Glass' trademark vocals and some juicy guitar hooks it's a pretty relatable pop tune with the refrain "I love being strange, it's an easy fit for me." Same. The band are currently on tour with Bad Sounds, and they're heading out on a headline tour to promote the record in April, including a show at Scala in London on the 17th. Head to the band's website here for tickets and to pre-order the album! Follow Indoor Pets - Facebook | Twitter | Instagram. First things first. If you haven't yet, stop what you're doing and take a listen to the debut Novo Amor record Birthplace. You can thank me later. In the week since it's release I'm certainly into a double figure listen count (it's probably 20+ if I'm completely honest...) and I'm finding more things that I love about the record upon each listen. It is a sublime piece of work: atmospheric, lyrically beautiful and perfectly executed - one of the best debut albums I have heard in a long time. I simply adore it. Novo Amor is the moniker of Welsh multi-instrumentalist, producer and songwriter Ali Lacey. 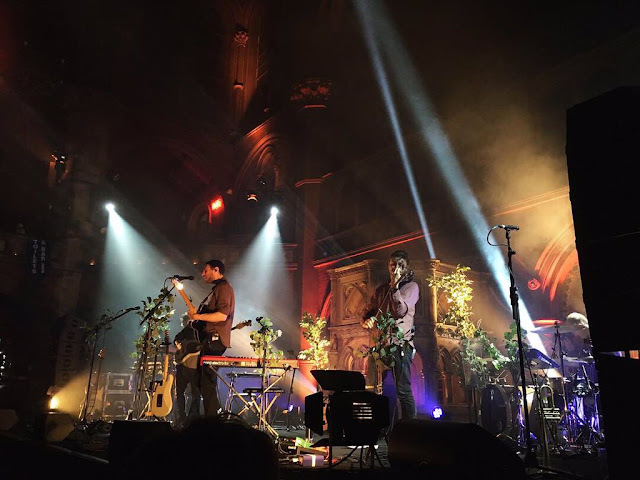 He's in the midst of a mammoth twenty-nine show full-band tour across the UK, Europe and the US to promote the record, and I was lucky enough to catch the last UK show of the run, the second of back to back sold out shows at London's Union Chapel. As suspected, it was a completely magical experience, made only more-so by the venue - reminiscent for me of catching the likes of Bear's Den, Stornoway and Matthew & The Atlas playing in churches in the past few years. There's something truly special, and almost transformative, about hearing this genre of music performed in such a setting. As those around me settled down for the show with mugs of hot chocolate and the lights went down, Anna Leone, tour support for the UK and European dates, took to the stage. With just her guitar for company, she transfixed the audience of the 900 capacity venue from the first notes, impressing with her well crafted lyrics and unique vocals. You'd hardly have guessed it was the biggest venue she'd played in, until she informed the crowd between tracks, describing it as a bit less daunting the second time around... but only a bit. Two of Ali's band members joined Anna on stage for the final track of her set, and we were given just a small indication of what we might expect from the rest of the evening. With anticipation in the air, the band took to the stage. I knew that it was going to be great, but I wasn't prepared to be on the verge of tears a couple of tracks in... Nostalgic, emotive music is most certainly my thing and the set ticked all the right boxes in that regard. The band delivered an incredibly powerful opening to the set, displaying the strength of Ali's back catalogue by storming through the record's leading singles Birthplace and Utican in the first few tracks. The six piece ensemble shone in upbeat tracks such as Utican and Emigrate, with particularly stunning violin and trumpet parts. Stripped back moments in the set were a display of Ali's incredibly tight harmonies with guitarist, collaborator and producer Ed Tullett. It truly was an incredible show, leaving me with just one thought... how have I not cottoned on to these guys sooner?! Ali seemed incredibly humble, always one of the best attributes for an artist to have. In a moment between tracks, he shared how grateful he was for us all coming along to the show and supporting his music, and how he was not only proud of his music being at a stage where he could fill a 900 capacity venue, but of the personal achievement in being able to stand up in front of that many people and perform. I find that we very rarely stop to think of the mental toll that performing in front of a crowd might have for our favourite musicians, and found it quite endearing for Ali to highlight this. Also worth noting, is something which initially drew me to listen in more depth to Ali's music when I first discovered Birthplace back in June, through its video which aims to highlight the issue of plastic pollution in our oceans. After a little perusal of the Novo Amor website, I stumbled very happily across a 'Sustainability' page, where Ali shares the ways in which he is aiming to make both the record (recycled packaging AND recycled vinyl pellets!) and tour sustainable, by working with both Julie's Bicycle and Energy Revolution to minimise the environmental impact of the tour. In an interview for M Magazine (PRS) Ali explains that "when artists tour we rarely consider the environmental impact of what we're doing. We forget about the thousands of litres of diesel we burn across tens of thousands of miles, the plastic bottles and disposable cutlery we use once then throw away, and we don't often stop to think about the inks and fabrics we use for our merchandise." I was genuinely chuffed to see the band using reusable water bottles on stage... a little quick maths later, I figure that between six band members across twenty-nine tour dates, they're saving over 170 plastic water bottles, a sizeable impact from a relatively small change, and something which I hope that more touring artists will adopt to do their bit for the environment. All in all, Novo Amor is quickly becoming my favourite musical discovery of 2018, and the show was a complete triumph. Check out the album, enjoy it as much as I am, watch out for future live shows, and if you're a band or musician - keep an eye on your environmental impact! A couple of weeks ago, I went along to Hoxton Square Bar & Kitchen to catch the only UK show on Fil Bo Riva's current tour. The show was a complete triumph, the venue was packed out with adoring fans, and songs new and old went down a treat. It was a really wonderful evening and great to hear a few unreleased tracks... Fast forward a couple of weeks, and FBR has (finally!!) announced his debut album Beautiful Sadness which is set for release on 22nd March next year. Still a little while to go, but from what he's released so far, I am certain it will be worth the wait! That includes brand new single Go Rilla, a tune which I simply can't get enough of at the moment. FBR details that the track is "about unbridled passion and the rapturous idea of escaping the real world" which came about "in Manchester in 2016 while supporting Joan as Police Woman through Europe that winter. It was raining outside and I was in the bathroom just before soundcheck... somehow I started staring at this poster of the club we were playing called Gorilla Club. I don't know why but I just got a flash inspiration, took my phone out and immediately started singing the chorus melody and words. Everything else developed some time after when I found other lyrics I had written down after a dream." The new track and album announcement come alongside a tour announcement too - he'll be taking Beautiful Sadness on tour across April and May next year, taking in a show at London's Oslo Hackney on the 1st of May. Full dates and tickets are available here. The Friday before last was a pretty exciting day for Paris / London based indie label Because Music. Not only did they put out the debut Parcels record (which, by the way, is rather wonderful and well worth a listen!) but they released a brand new Django Django EP. The Londoners have had a busy year with the release of brilliant third record Marble Skies at the start of 2018, and they're back already with the Winter's Beach EP. As is part of their charm, no two songs on the release sound the same, they're constantly bending genres and experimenting with new sounds. Closing track Blue Hazy Highs is a little slower than we've come to expect from the band, putting the focus entirely on the vocal harmonies that the quartet are loved for. For me, lead single Swimming At Night is my definite highlight of the EP, take a listen with the official video below, and check out the full EP on Spotify here! Follow Django Django - Facebook | Twitter | Instagram. Rae Morris is a complete star. Her record Someone Out There was released at the start of the year, and as I've written on here a few times already, it very quickly became a favourite of mine - it's my album of the year so far, easily. Not only did I completely love the music, but I connected with the lyrics on several of the tracks. It's a little bit of a cliché and not something I'm really accustomed to, but it felt as if Rae had penned down tracks explaining exactly how I was feeling at the time. It is now one of my favourite ever records, and I was ecstatic to see Rae perform live in Nottingham's Rescue Rooms a few weeks back, bringing tracks from the record (and her beautiful debut Unguarded) to life with infectious energy, passion and humility. While some of the faster tracks like Dip My Toe and Atletico (The Only One) are highlights of the record for me, I was really struck by the album's closing track (and slightly slower tune) Dancing With Character upon the first few listens. In a track by track description of the album, Rae details the beautiful story behind the track, which was inspired by her best friend's grandparents. It is a simultaneously heart-wrenching and heartwarming track if you listen to the lyrics closely. Signing off on the Someone Out There era, Rae has shared a simple but rather exquisite video for the track, dancing with her gran in Blackpool Tower Ballroom. From Rae: "Thank you for all your passion, love and constant support for this record. I'm going away for a few months to write the next era. I've got a good feeling about this one." I absolutely can not wait to see what Rae does next, and will be listening to this record with so much adoration for a while to come yet! Follow Rae Morris - Facebook | Twitter | Instagram. Follow Sivu - Facebook | Twitter | Instagram. They're back!! Friendly Fires have shared their second single of 2018 in the shape of Heaven Let Me In, which was premiered by Annie Mac as her Hottest Record in The World earlier this week. It's a complete and utter tune, and was co-produced by Disclosure no less. In true Friendly Fires style there is so much going on in the track, with the funkiest of beats gravitating around frontman Ed Macfarlane's soothing vocals, coming together to make something altogether... well, heavenly. During the premiere, Annie interviewed the guys, who told her that the tune, alongside Love Like Waves, are taken from an upcoming record (!!) which Ed explains is "going good. We have a deadline and we're getting there." You'll find me eagerly awaiting news of this record until it arrives! Seeing Friendly Fires live earlier in the year as they returned after a few years away from the stage was honestly one of the best live music experiences I've ever had. The show was a complete joy from beginning to end. Not least because of Ed's infectious dance moves. They've just announced an intimate club tour for November, where they'll be playing live in club venues, where they started out, alongside a line-up of DJs - tickets go on general sale tomorrow, grab yours through their site here. Follow Friendly Fires - Facebook | Twitter | Instagram. Back in May, Public Service Broadcasting performed on the Titanic Slipways in Belfast for BBC Radio 6 Music's 'Biggest Weekend' festival. For the show, the band were commissioned to create tracks surrounding the theme of the Titanic, which frontman J. Willgoose, Esq. described as "our attempt to pay tribute to the people that built her here in Belfast, the spirit of optimism of the age that she represented and the 1503 people who died when she sank at sea." You can watch the four tracks being debuted at the show here. They're finally releasing the tracks as an EP next Friday (26th), and have released a video for the title track White Star Liner which you can (and should!) watch below. I can't wait to see the band perform at London's iconic Royal Albert Hall on 1st November (my third show in the venue this year!) - particularly after their show at Eventim Apollo last October was a musical highlight of the year for me. The RAH show sold out pretty quickly, but there are some tickets available (here) if you're willing to sit in the choir seats - a unique view of a beautiful venue! Follow Public Service Broadcasting - Facebook | Twitter | Instagram. Brilliant news! The show was recorded in its entirety and is being released by the wonderful folk at Transgressive on 30th November. As well as a digital version, the live album will be released on double CD and triple (!!) LP and you can pre-order all versions here - there are even signed copies! As far as I know, it's the first show that I've been to that is being released in this way, so I'm pretty excited to relive the show and have something concrete to treasure it by. For now, here's a video of the first track to be released from the show, The Night My Piano Upped and Died, with visuals from Sussex Wit bassist Joe Zeitlin. Similar visuals served as the backdrop for the show, reacting in real time to the sound levels in the room - it was truly magical to watch, adding another dimension to the performance. A few words from Johnny himself about the show... "On 17 October 2017 we played a gig at The Roundhouse in Camden. It marked the end of a period of touring [and] happened around the ten-year-anniversary of recording our first album 'A Larum'. It felt like a special night in lots of ways, but mostly because all our best beloveds were there and we were able to celebrate our friendship as a band and the music we have been making since those early days in the backrooms of pubs and flats, mostly a stone's throw from the Roundhouse." Follow Johnny Flynn - Facebook | Twitter | Instagram. You learn something new every day... personally, I've just been taking a detailed listen to Cosmo Sheldrake's Tardigrade Song and learning about the resilient micro-animals that are Tardigrades. As if I didn't already think that Cosmo was a musical genius, I now discover that he's been educating listeners all this time... with lyrics such as "I can live life in vacuums for years with no drink, and put up with hardships more than you can think." Take a listen to the track in this brand new video, where, in true Cosmo form, he performs the track live at an apple orchard in Devon, while "industrial quantities of cider" are being made in the background. Check out the studio version of the track on his superb Pelicans We EP here. I caught Laurel playing live in a cinema for a Sofar Sounds show in Oxford a couple of years ago, and was pretty instantly mesmerised by her. Over the last year or so I've been keeping an eye out as she teased us with singles, and she finally released her long-awaited debut album Dogviolet back in August. One of my favourite tracks from the record is Adored, and it has been given a wonderful music video to match which you can check out below! I completely love Laurel's vocals and this song is a beautiful display of them - get listening! Follow Laurel - Facebook | Twitter | Instagram.